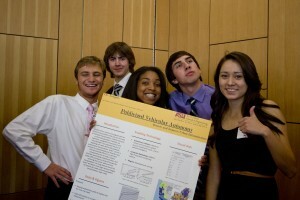 Grand Challenge Scholars Program students showcase their “Sci Fi Solutions for the Grand Challenges” projects. Sponsored by the National Academy of Engineering, the Grand Challenges are specific problems within the broad areas of sustainability, health, vulnerability and joy of living. Learn more about the Grand Challenges at www.engineeringchallenges.org. Students enrolled in FSE 194 Perspectives in Grand Challenges for Engineering in the fall semester were divided into 14 teams. The teams were charged with explaining the nature of a grand challenge engineering problem, with particular interest in the root causes, from scientific, technological, political, global and social perspectives. The teams investigated all aspects of a futuristic solution, including side effects, hidden and external costs, and long-term implications. Each team presented their solution to their fellow students, faculty advisors and guests during a poster session.